Friends of the West Shore works toward the preservation, protection, and conservation of the West Shore of Lake Tahoe, our watershed, wildlife, and rural quality of life, for today and future generations. There have been some recent developments and planning activities that we wanted to share with you in a timely manner. Please continue reading below for updates regarding the Homewood Mountain Resort, Fanny Bridge/SR 89 Realignment Project, Alpine Meadows to Squaw Valley Gondola, and upcoming opportunities to support improved transportation planning. We would also like to thank our members and supporters who donated in response to our last newsletter. We appreciate your support! We recently received a copy of an "Offering Memorandum" for Homewood Mountain Resort. The Offering is a proposal to potential investors to provide financing for the new development. JMA Ventures has recently confirmed to us that there is no change in ownership and they are still the sole owner of HMR. JMA also confirmed that nothing's changed concerning the intent of the Master Plan development, and the resort and its amenities will continue to be available to the residents of the West Shore, as previously promised. ﻿The Tahoe Transportation District (TTD) recently provided the following construction updates ( read full TTD email here ). The new highway segment, new Truckee River Bridge, and two roundabouts on either end of the realignment are anticipated to be completed this year. However, due to high water levels, construction may not begin until sometime in mid-June. The rebuild of Fanny Bridge will not take place this year. The final Environmental Impact Statement/Report is now available ; public hearings will be scheduled in May. We will provide more information in our May/June newsletter. Placer County is developing Transportation Demand Management (TDM) strategies that focus on enhancing travel options and encouraging the use of alternative travel choices (e.g. transit, ridesharing, walking, and biking). View the summary of options here and the draft report here . Placer County staff will present the report to the North Tahoe Regional Advisory Council. April 11, 2019 at 6 p.m. The strategies are primarily focused on improving travel options once residents and visitors are within the Basin (i.e. the "park-once" approach). While we still have a long way to go to address traffic entering and exiting the Basin, implementing these options is an important starting point. Further, if it is easier to get around the Basin without relying on a personal vehicle, it will be easier for people to travel to the Basin via transit, trains/buses, ride sharing, and other options that reduce reliance on personal vehicles. We encourage you to submit comments ( click here to email ) and/or attend the 4/11 meeting and ask Placer County to implement these options. FOWS is always in need of funds to support the use of our consultant who reviews and makes scientific comments to the Tahoe agencies to improve local projects. Please consider a tax-deductible donation soon! Note: we have reestablished the ability to donate online using PayPal . 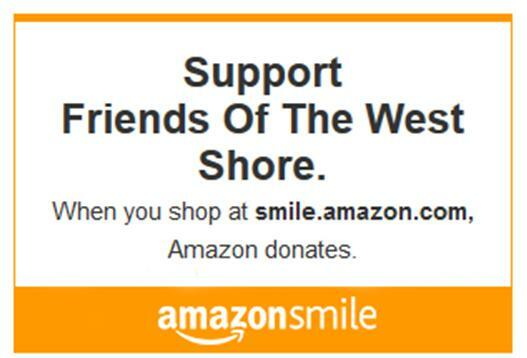 We've joined the Amazon Smile program; all you have to do is order from Amazon through smile.amazon.com and 0.5% of your purchase will be donated to FOWS at no additional cost to you! The eScrip Shares program allows shoppers to designate FOWS to receive donations earned through their purchases; up to 5% of your purchase will be donated to FOWS at no cost to you. See which retailers are participating here and sign up through this link . Please contact Jennifer Quashnick, FOWS Conservation Consultant, at: jqtahoe@sbcglobal.net , or Judith Tornese, FOWS President, at: jmtornese@aol.com .